UConn Extension has noticed a growing problem in Connecticut landscapes – tree volcanoes. 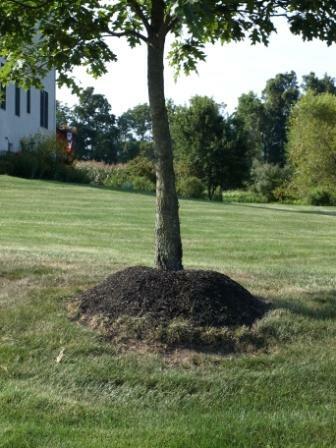 A tree volcano occurs when mulch is piled around the base of the tree and climbs up the trunk. The shape of the mulch resembles a cone or a volcano. Mulch volcanoes waste money and damage trees. Mulch is useful at the base of a tree for many. When done correctly, the mulch protects the tree from a lawnmower or string trimmer, aids in keeping the soil moist and keeps the ground cooler in the summer and warmer in the winter. Mulch also improves soil structure, aeration and prevents soil erosion and runoff. Bark is the outermost protective layer or skin of a tree. To properly function, bark needs to be exposed to air. When mulch is piled around the trunk of the tree, the mulch softens the bark and allows outside organisms like varmints, insects, bacteria, virus and fungi to penetrate into the tree. Over time a tree volcano will kill the tree. Before you apply mulch, remove any weeds from around the tree. The mulch ring should be 2-3 feet wide around the tree trunk radius. Maximum depth of the mulch is 2-3 inches – the roots need to breathe. Taper the mulch layer to the grass at the edge of the ring. Aged wood chips or shredded bark are the best choices for mulch. Mulch shouldn’t touch the bark of the tree. Trees 10 inches in diameter and larger don’t need mulch.